MEXICO CITY (Sputnik) – Venezuelan President Nicolas Maduro put the blame for events that would happen after a possible coup in the Latin American country on Spanish Prime Minister Pedro Sanchez. "If one day there is a coup, if one day there is an American military intervention, Mr. Pedro Sanchez, your hands will be stained with blood forever, and history will remember you as a puppet who went into the service of the militant policy of intervention of Donald Trump," Maduro said in his address to the military. Earlier in the day, Spain recognised Venezuelan opposition parliament speaker Juan Guaido as the country's interim president, while Sanchez made a respective statement. In addition, Guaido was recognized by Austria, Denmark, Finland, France, Germany, Latvia, Lithuania, the Netherlands, Portugal, and the United Kingdom. The moves came after the deadline set by the European Union for Maduro to announce snap a presidential election elapsed on Sunday. EU countries were expected to recognize Guaido in a joint statement, but, according to a comment of a diplomatic source in Brussels to Sputnik, Italy blocked the statement. Venezuelan President Nicolas Maduro has announced a nationwide effort starting Wednesday to collect signatures against US invasion after its leader said military intervention was an option. 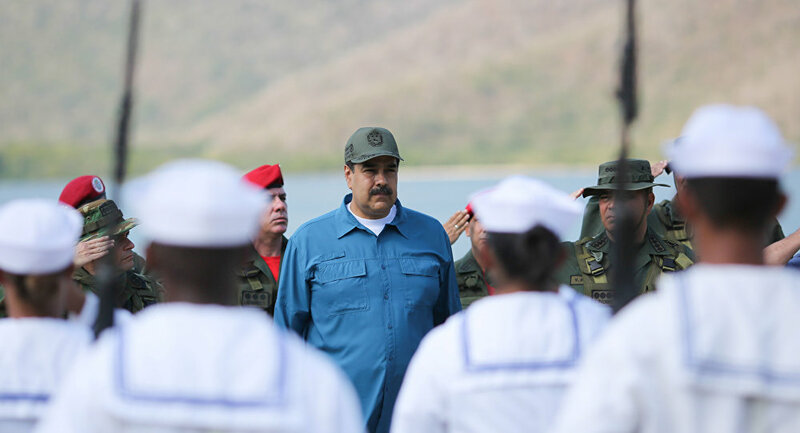 "Some are threatening Venezuela with intervention … We will launch a nationwide action this Wednesday to collect signatures in response to this threat and present them to the White House," Maduro said at a military parade in the state of Aragua. The Venezuelan leader blamed his US counterpart, Donald Trump, who suggested sending troops to Venezuela in a Sunday interview with CBS, for violating UN rules that forbid threats or use of force against the territorial integrity or political independence of any state. Washington has mounted economic and political pressure on the South American nation in a bid to install opposition leader Juan Guaido as interim president. Russia, China, Mexico and several others have backed Maduro, while Italy vetoed an EU statement recognizing Guaido, according to a Sputnik source in Brussels. Tensions in Venezuela escalated nearly two weeks ago when Guaido declared himself interim president, disputing last year's re-election of Maduro. The opposition leader was almost immediately recognized by the United States and several other countries. Russia, China, Mexico, Turkey and Uruguay were among those that have voiced their support for Maduro as the country's legitimately-elected president.